The Royal Canadian Navy will mark the anniversary of the Battle of the Atlantic this Sunday with the unfurling of a new Canadian Naval Ensign to be worn by Her Majesty’s Canadian Ships, naval vessels, Naval Reserve Divisions and other designated units. “The adoption of a new Canadian Naval Ensign demonstrates our deep attachment to a widespread tradition among navies of the world. The new Canadian Naval Ensign will become the flag under which our Navy will defend Canada’s interests at home and abroad,” said Defence Minister Peter MacKay during a gala dinner in Ottawa Thursday hosted by the Naval Association of Canada to honour veterans of the six-year battle. “We are restoring the use of a standard Commonwealth practice, and an important symbol recognizing our rich naval heritage and the historical roots of the modern Royal Canadian Navy,” said Vice-Admiral Paul Maddison, Commander Royal Canadian Navy. Jack. “Today, the flag previously known as the Naval Jack is adopted as the new Canadian Naval Ensign, and the National Flag becomes the new Naval Jack,” the Navy said in a statement. The new Canadian Naval Ensign will be worn at the masthead while at sea, or at the stern when alongside, moored, or at anchor. The National Flag will be worn as the Naval Jack at the bow when the ship is alongside, moored, or at anchor. The new ensign will take effect at 8:00 am local time on Sunday on ships and naval reserve divisions across the country. The first will be HMCS Toronto, deployed on operations in the Arabian Sea. In Canada, the first naval reserve division will be HMCS Cabot, a stone frigate based in St. John’s, Newfoundland. At a press conference in Ottawa, Admiral Maddison said that most Commonwealth nations wear a distinctive naval ensign on their warships that includes elements of their national flag in recognition of their special status under international maritime law, which stipulates that warships on the high seas have complete immunity from the jurisdiction of all states other than their flag state. 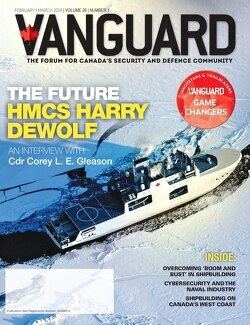 The new ensign would distinguish RCN warships from other Canadian vessels and allies around the world. “Canada is now returning to that international practice,” he said, which is part of a wider government effort to recognize the heritage of the Canadian navy. In 2010, the executive curl was returned to navy uniforms and “Royal” was restored to the official name of the service.